I’ve never tasted terroir as intensely or unequivocally as I did in Dénia, Spain earlier this year. It is a dynamic experience, where prehistory meets the future, where the land meets the sea, and where one dons chef Dacosta’s “hat” and tastes and sees his world from his perspective, as if you know and own it for yourself. It is an experience like no other. And it changed my life. If Adam and I were going to drive five hours from Barcelona to Dénia, a small beach community south of Valencia along the coast of Spain, we figured we might stay a while. 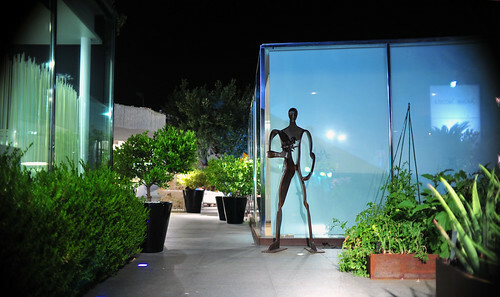 Initially, we had planned on having two meals at Quique Dacosta – dinner the first night, and lunch the following day. But, after lamenting that Dacosta no longer offered his famous rice menu – a collection of dishes made from the short-grained rice famous from his region (this is paella country) – he encouraged us to return for a third meal, dinner on the second night, when he’d revive one of his rice dishes for us. So, we stayed a while. At the time of our visit, the restaurant offered two tasting menus. The shorter of the two, “Menu Universo Loco,” was 12 courses and cost 110€. The longer one, “Menu Salé e Sol,” which was over 20 courses, cost 140€. We started with the shorter menu first, and ordered the longer one for lunch on the second day, after which, we returned, a few hours later, for that promised rice dinner. Instead of writing about each of these meals separately, or even focusing on that second meal, which was, by far, the most memorable of the three, I’m choosing, instead, to present my experiences at Dacosta in one story. I’ve embedded slideshows of my three meals at the bottom of the post if you want to delve into the food more deeply on your own. Like so many restaurants in lower Europe, the dining experience here starts outside, a series of snacks on the deck, before moving inside for the main courses. And after dinner, you’re moved, once again, to a lounge, or back outside if weather permits, to finish off with aperitifs and sweet nothings (here, crunchy beads of chocolate caviar). The clime was particularly nice the two days we spent in Denia, so this is how each of our three meals unfolded. From the road, the restaurant looks rather randomly situated, a modishly white façade rising from among the shacks and tacky strip malls that line the ocean drive. But once inside its patio garden, all of the visual noise around it falls away and leaves you in stillness. And it is lovely. Every one of our meals started with the same onslaught of contrasting flavors and textures, a crowd of bites and sips: a bracingly tart hibiscus tea, served cold; a spicy cinnamon basil leaf glazed with a sweet syrup; salty tobiko roe countered by the fragrance of kumquats; and pickled raim, a particularly ancient looking succulent, served on rocks. There are little shrimp chips, meaty snails, and naked stevia leaves that, like licorice, offer an unnatural sweetness that seem to thrill European chefs to no end. After three meals at Quique Dacosta, I realized that, like the rest of his food, these pre-meal snacks are pieces of a mosaic, which, by themselves may not make much sense, or impart pure pleasure (and, perhaps this is one reason why he has not entered the mainstream the way many of his colleagues have; more on this later). But, taken as a whole, they confidently convey a sense of history and place. Even though I had never been there before, it was unmistakable: this was the heart of the Levante, as it is and has always been, where the land and sea meet at sunrise; an ocean teaming with life and a land lush with produce. You taste this in Dacosta’s food, which has the salty smell of the ocean, the slightly vegetal taste of the earth, and above all, the intensity of the sun. Even at night, his food tastes like day. It’s pungent, it’s hearty, it’s so fresh that it’s alive, and, somehow, even though I am not from there, it is innate. The contrasting flavors at the beginning didn’t disappear after those introductions on the patio. But they did lose some of their edges at table, mellowing into more comforting and, for me, more familiar forms. If you’ve never tasted the ocean, you won’t leave Dacosta’s without knowing its flavor well. A suquet – a murky fish stew, this one with algae and sea cucumbers – served on our first night was, as Adam aptly described it, like licking a pier post. Its flavor was strong, more briny than fishy, but certainly palatable, and incredibly evocative of the sea. So was a fat oyster, which which arrived in its shell, buried in scalding-hot rocks. Uncovered, we slurped its juicy warmth, liquor and all. There was a pair of baby squid with a warm shellfish dipping broth, and tender tails of red king prawns, simply blanched and served with nothing but the sea water sweat on their backs. They were incredibly sweet and, with the way Dacosta blanched them, impossibly silky; essentially raw, but warm. He served us the rest of the prawn as well, so that we could taste its every part. The torso he fried, until the legs became crispy and light. The hood he overturned and filled with the concentrated juices of prawn coral; this we sipped. 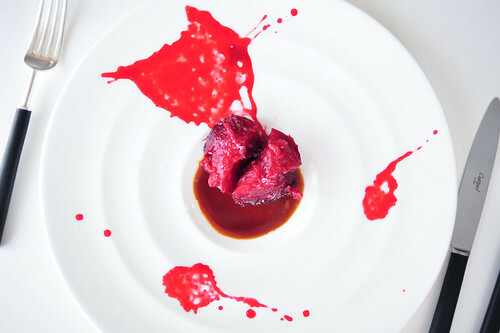 And he extracted and distilled the juices from the head, and encapsulated them in prawn gelatin to form a ruby cannonball, which was set afloat in a rich shellfish broth fortified with cognac. This entire prawn collection was just one of many courses from the sea. Dishes from the land tended to be lighter, focused more on vegetation and textures. 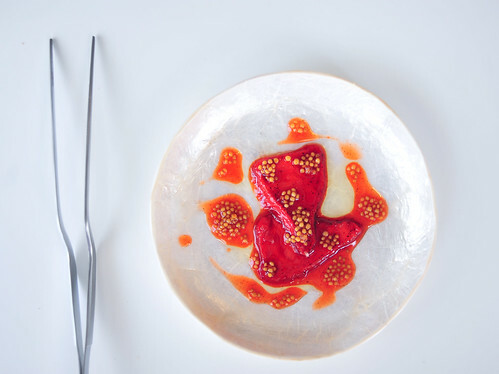 Of the dishes we had, these seemed the most revisionist: a rewriting and reformulation of Spanish cuisine, flavors, and tradition, a hallmark of “modernist,” or “vanguardia” cooking (Dacosta bristled at the mention of “molecular gastronomy”). The morning dew was brought to us in a bowl, a tuft of snow with crystalline ice plant and a viscous substance that tasted like flowers with a touch of honey. Tomato water was also frozen and finely shaved atop tomato sauce with herbs and drizzled with sun-dried tomato oil. This tasted like a cold pizza, actually. And there was a frozen ajo blanco as well, garlicky, yet clean and refreshing for a summer afternoon. This, I could have eaten all day. 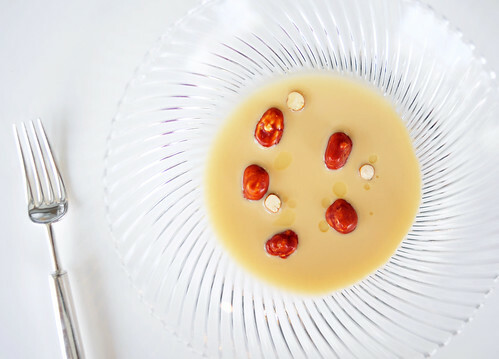 He juiced chufas – or tiger nuts – and served it as a cold soup, nutty and sweet, with a touch of truffle oil. In the shallow pool bobbed chufas, both real and mimetic; the latter being nuggets of foie gras thinly coated with chocolate that surprised me again and again with their texture. Even though I knew they were a trompe-l’oeil, I still expected them to be crunchy, like the real nuts next to them, not creamy. At our final meal, Dacosta asked if there were any dishes from our previous meals we’d like to have again. This was one of them. It wasn’t the most delicious of the lot, but it was one of the most thoughtful and dynamic assembly of flavors and textures I’d ever experienced, and I wanted to burn it into my taste memory. And there was a wedge of creamy, ripe avocado, lightly smoked to match the bonito broth with which it was served. The avocado was dusted at the table with freshly shaved avocado pit, which, like those chufas, offered a mild, crisp sweetness. This was an amazing dish. As primitive (or, should I say, “natural”) as his food appears, there was actually quite a bit of modern cooking happening in Dacosta’s kitchen. And he used it playfully to surprise and provoke, seamlessly inserting it to recreate and mimic nature with food, and thereby upending expectations. This too is a hallmark of the vanguardia. There were simple, yet astonishing eye tricks, like a saucy set of piquillo peppers that weren’t piquillo peppers at all. It was clear when we were eating them that they weren’t peppers. But what were they? Adam and I both guessed that they were made from eggplant. Dacosta later showed us the triangular cutter he used to stamp out slices of watermelon, which he dehydrated, to look like peppers. Clever. There were complicated ones too, like an “egg” with a runny, warm yolk encased in a layer of chicken stock gelée and tissue-thin “shell” of white asparagus gelatin. This dish was entitled “Which Came First?” And there was a cross section of a shank bone made from gelatinized bone marrow. The “bone” was filled with a rich oxtail soup and served on a plate with a shockingly sweet dot of concentrated licorice sauce. I can’t say I entirely understood the purpose of the licorice – perhaps it was nothing more than a jarring contrast to the meatiness of the marrow and oxtail, or the rostit (rich beef broth with Parmesan foam) served on the side? But otherwise, this dish was incredibly delicious, if not calorically damning. All three of the rice dishes we had were spectacular, especially a piping hot risotto, thick with the flavor of shellfish and blanketed with carpaccio of galera, or mantis shrimp, which are usually used for stocks and soups since their meagre form doesn’t yield much meat otherwise. Served with rice chips dusted with nori, the marriage of land and sea was complete here. The desserts at Quique Dacosta were spectacular as well. In fact, they were among the best I’ve had this year. The first night, we had a deeply satisfying dark chocolate and hazelnut composition made to look, convincingly, like a pile of slate and rocks. Some of the “slates” were crisp meringues, but others were slices of chocolate ice cream coated in dark chocolate couverture. At first glance, I thought they were chocolate-coated brittle, only to be surprised by its cold, creamy texture. My gosh this was tasty. 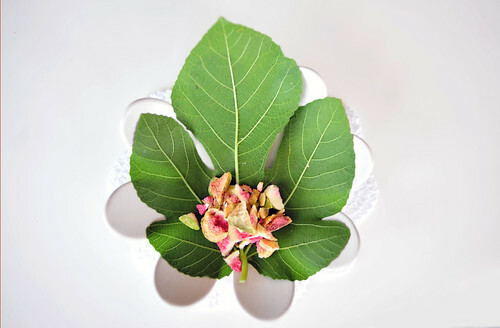 At lunch we had a collection of fragrant sweets, a light and refreshing end to the heavy flavors that came before. There was a fluffy sponge made to look like a honeycomb. This was drizzled with orange blossom honey. And there was a staircase of petits fours, green with matcha and perfumed with apples. All of these were wonderful, especially an airy foam that seemed to evaporate into a cloud of apple blossoms in the mouth. I know that some have described these desserts as tasting “soapy.” I can see how that might be, especially that sponge with orange blossom honey. But I loved them, both for their fragrance and their ability to lift away the lingering weight of the land and sea. Needless to say, Adam and I were served very well. The maitre d’, Didier, had remembered Adam from his meal two years before, and graciously took us under his care for the duration of our stay, treating us more like friends than guests. After our last dinner, Dacosta invited us into his test kitchen, where we spoke at length about his philosophy of cooking and his outlook on modern, Spanish cuisine. Too much transpired to repeat here, but I will refer you to this insightful interview that Dacosta gave Eater days after I ate at his restaurant. It touches upon many of the things we talked about that night. Why doesn’t Dacosta get more press? Why is he so overlooked? The food he is cooking in Dénia is progressive, meaningful, precise, and unique. And he’s been cooking it for years – many of the dishes we had were dated as far back as a decade or more. I’ve never encountered food like his anywhere else in the world. Dacosta is thinking and using ingredients in ways that no one else is, and to extraordinary affect. He is a true ambassador of his region, condensing and conveying its flavors, colors, and textures to diners who are lucky enough to make it to his table. So distilled is his food that I left with a clear sense of Dacosta’s Levante in my mind. I will know it immediately if I ever get the chance to smell and taste it again. 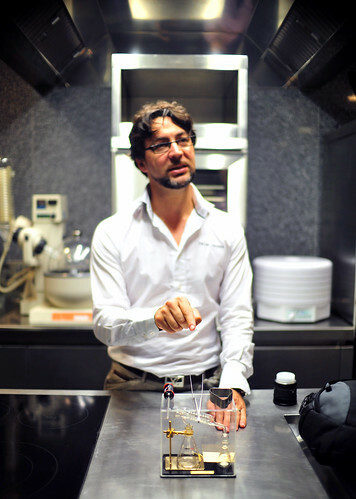 Dacosta is an exciting and important voice in the vanguardia, along with his colleagues to the north – Adria, the Roca brothers, and Ruscalleda – and in the Basque – Berasategui, Aduriz, and the Arzaks. And yet, they all get much more attention than he (most recently, in an article by Jonathan Gold published this week in the Wall Street Journal entitled “Eating Spain,” all of those heavyweights, except Dacosta, are mentioned). I’m not the most well-traveled eater out there. 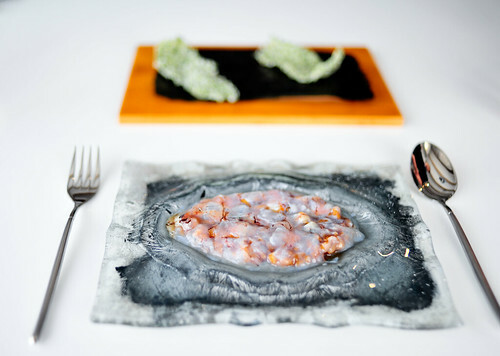 But if you ask me, Quique Dacosta is certainly one of the most exciting and important restaurants that I’ve encountered. Write his name down. And find a way to get there. * You may know of this restaurant by its former name, El Poblet. In 2009, Quique (a Spanish nickname for Enrique) Dacosta took over and put his name on the door. ** With the recent reconsideration of Natalie Wood’s death, I’ve been reminded of the movie she was filming when she drowned. Brainstorm is about the invention of a “hat,” which, when worn, records the experiences of the wearer. Those experiences, visceral and real, can be replayed for another. ~ by ulterior epicure on December 6, 2011.